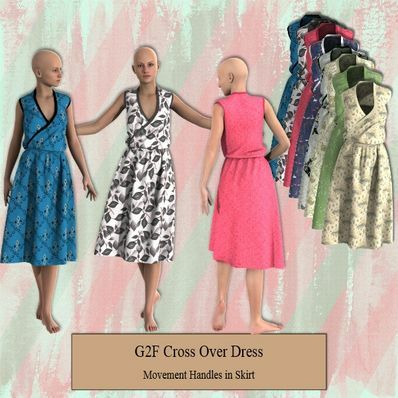 A Cross Over Dress for Genesis 2 Female for use in Daz Studio 4.6. Your dresses are wonderful! Thank you!! Thank you for sharing this beautiful dress with us. I love the colors you chose. Great crossover dress, thank you for the handles. Please note. You must completely uninsatll the old file as any new textures made by 3rd parties may not work properly. Now it works fine! Thanks! Hopefully this is the correct file. I am so sorry for all these problems. OK I have had to remodel part of the dress, which means I had to reload it, amend the textures and the Metadata. You will need to completely uninstall the original download and then install this one. Sorry for any inconvenience. There is a problem with the UVMap but as yet I can't fix it. I have included the UVMap that I used to do my textures for anyone who wishes to make their own textures. Please re-download the file if you need this. Thank you, grateful as always for all you do! I always appreciate the effort you put into these items Wendy. My Genesis' closet would be empty without you! Absolutely amazing, thank you very much! I wish I could press the 'Like' button 5 times. Thank you! Great detail Wendy. Thank you very much. I too love the folds you have added to this dress. I always appreciate too. your work life looks like holy. Looooooooove the wrinkles in this dress... looks very natural :) Thank you!!! Thanks! I don't always comment, but I always appreciate your freebies. They are awesome! Looks really fine! Thank you so much!